WARNING: This post contains potential spoilers to the achievements and possibly some minor hints to content in Cataclysm. You have been warned. The problem was made even worse when the blues on the forums were trying to explain through some strange attempts at legalese to weasel the way out of the explanation that they had given that it WOULD be doable even in Cataclysm, so there was no need to rush and now a mere month and a half before the expansion arrives, they’re going back on it. This made the already mad people, even madder. They were going insane over not being able to go insane. Normally, I try to give the blues to benefit of the doubt – but this was pretty far fetched. The general argument was that it was still going to be in the game, as in it wouldn’t be removed for people who already had it, but you wouldn’t be able to get it anymore, that it was a Wrath of the Lich King only kind of thing. That was what they meant when they said it wasn’t going away… oooooh… So then why didn’t we not have to rush to get it done before Cataclysm? Yea, it was a pretty sketchy situation, but I was happy to see that in the latest Beta build that they’ve actually altered the achievement. Insane in the Membrane no longer requires being exalted with the Shendralar. Now granted, it’s still beta (Still…) and can change at the zero hour, but that means that if you only have the Shendralar left, then you will have the achievement come Catalcysm. If not, it means that the achievement should technically still be obtainable. While I do hear that Ravenholdt is going to be harder in Cataclysm, but I can’t confirm that. Sadly, I can only see the onslaught of complaints this will generate from those who already got Shendralar to exalted. I mean, that’s no easy or cheap task. Between carting all the books around and of course the other materials to use said books, there’s a hefty amount of work that will probably be seen as “unnecessary” in the eyes of those who already spent their time on it. The only thing I can possibly say to alleviate the building rage in people’s hearts is that it’s not like there was much choice. It was either remove Shendralar, or remove the achievement (from being obtainable at least). Which I suppose that someone will undoubtedly say that others shouldn’t be able to get it anymore because they already have it. Someone always says that. Same with mounts, pets, weapons, etc. /sigh. But really I think this news is great. 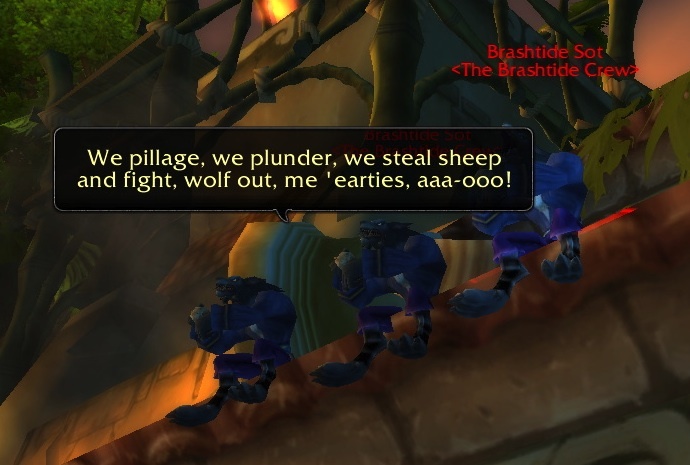 Finally, if Dire Maul is changing as much as they say that leaves the question of what to do about the grind of getting Honored with Bloodsail and Exalted with the goblins at the same time, since you might not be able to free the little goblin and get the ogre suits anymore. There’s still substantial talk that this isn’t a requirement anymore and you can do one and then the other without worrying about losing the requirements. The problem is there’s no consensus and the mileage seems to vary depending on person to person, mostly due to the fact that the achievement, being a feat of strength, is not trackable. So I’ve taken it upon myself to test this (since I have time to kill… and plenty of goblins to kill) using the tracking macro: “/script AddTrackedAchievement(2336)” which I was able to find on the forums. 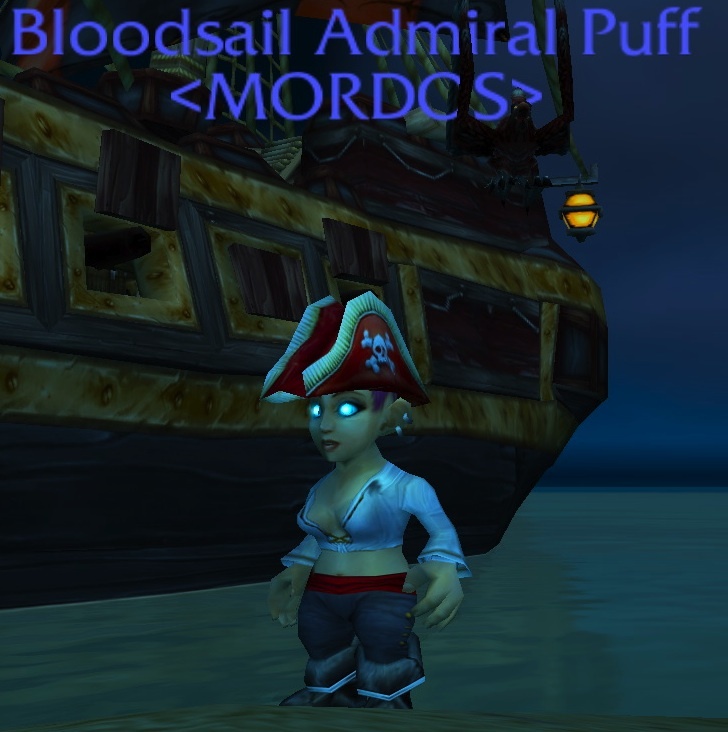 I’ll be getting back on here on whether or not the cloth turn ins remove my Bloodsail rep requirement from Insane on the Membrane here soon. Till then, rest easy about scarfing down every Pristine Black Diamond that pop ups on the auction house, save your gold for some Darkmoon cards, and I’ll post again on this when I have more news.